Fixed Hilandia Church crash and other more minor issues. Big bug fix/polishing release. Over 25 issues addressed or fixed including crash fixes, graphical glitches, script errors, mistranslations, and other improvements. Finally! At long last, I give to you Dual Orb 2 in full English glory! It's been a long year and a half. I know there are other projects out there that have taken longer, but I have worked almost entirely, and exclusively on Dual Orb 2 for the full year and a half. I never really took any extended breaks either! Alot of work has gone into this project. I have been a one man team aside from Akujin. When Akujin came on board, he translated the entire script, retranslating what was already done and continuing right to the end. I think he did a wonderful job, and with a final edit done by himself and David Mullen, the story came out very well written and very enjoyable! It was a pleasure working with Akujin, and I think you'll be very happy with his work. I think this project was one of fairly high magnitude. With 343 text blocks, multiple methods of evil compression, and all around general evilness, it was definitely a challenging feat to hack/translate. Others tried and failed, but this time we were successful! I say 'we' because it was a team effort. The romhacking community for the most part is a team. I couldn't have done it without the help and support from my fellow hackers! =) Because of that, I give this translation to the scene as my contribution, for all the hard work they have done for many of the translated wonders we can now play because of them. And for the respect, friendliness and help that many of those individuals have shown me. 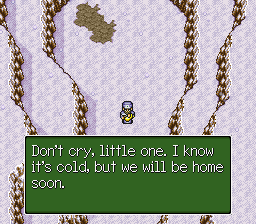 I also give this translation to the public, for their support in hopes that they will give this little gem of a game a chance, and so they may enjoy a game that would otherwise not been accessible for them to play. 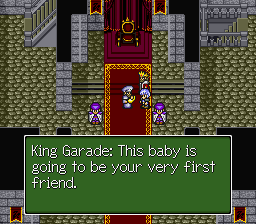 I believe this quality of this project has turned out to be amongst the best of fan translations. 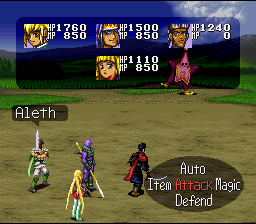 It may not be a Square game, or Tales of Phantasia, or Star Ocean, but it is a good game in it's own regards and has received what I believe to be a quality translation approaching that of the aforementioned games. 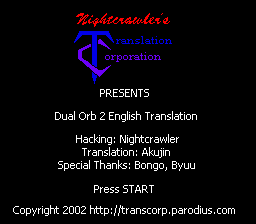 So, without further delay, I present to you Dual Orb 2 in English brought to you by Nightcrawler's Translation Corporation! Enjoy! 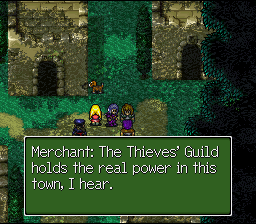 I think this is a very good RPG. 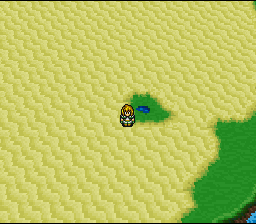 It is rather linear, but it has great music, pretty nice looking graphics, and a very nice story. The characters are lighthearted and it simply a fun game to play! 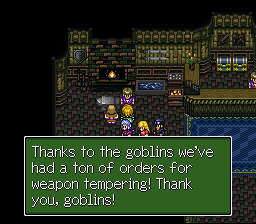 It has a very rare weapon system for RPG's. The weapons are upgradeable and have 19 levels. You can upgrade them in the blacksmith, or find them in treasure chests. Sometimes you can even get a cursed weapon at level -1! The game is HARD! When I say hard, I mean HARD! 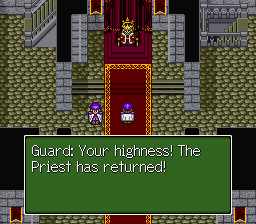 You will be begging for mercy from the bosses later in the game. The first half isn't that bad, it's the second half that'll get ya. If your sick and tired of today's cheesy easy RPG's, this game is for you! You'll definitely get a challenging experience. I'm definitely excited to be able to share my work with the rest of you and give you a chance to play something you otherwise wouldn't be able to! 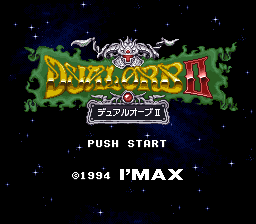 The patch is 100% and fully translated, but does have a few glitches mentioned in this readme! Oh yeah, hey feel free to send me some supportive e-mails! It's tough to work on projects when you feel unappreciated sometimes. Appreciation gives us Rom hackers inspiration to continue! It's complete now, so you SHOULD find everything 100% translated! There are a few known issues though, mentioned below. Sorry, there really aren't any other Easter eggs that I have put in the patch. I think the game speaks for itself and doesn't need any 'additions'. Kardosa Castle, Empty Windows after Sindra fight - After defeating Sindra, you may try to 'talk' to the lift control panel or ledge by the lava. The original game crashes here. The patch does not, but text windows are blank instead. 1. Karina Level 20 Weapon Quirks - If Karina is equipped with a level 20 weapon and you get first strike entering battle, Karina's 'Stab' command will not appear until the second round, though it is still selectable in the first. If the level 20 weapon equipped is 'Moon Light', the Tech command will also be garbled, but functional. 2. Scan spell - The enemy weakness text from the scan spell is not translated. It still shows you the HP and MP though. All the guys who support me and my project on my message board! The guys at the Whirlpool!